The year 2015 marks the fiftieth anniversary of Berkshire Hathaway under Warren Buffett's leadership, a milestone worth commemorating. The tenure sets a record for chief executive not only in duration but in value creation and philosophizing. 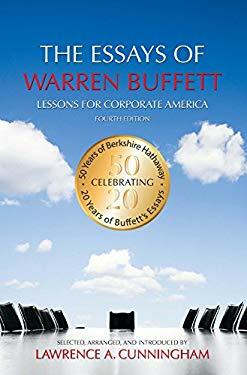 The fourth edition of The Essays of Warren Buffett: Lessons for Corporate America celebrates its twentieth anniversary. As the book Buffett autographs most, its popularity and longevity attest to the widespread appetite for this unique compilation of Buffett's thoughts that is at once comprehensive, non-repetitive, and digestible. New and experienced readers alike will gain an invaluable informal education by perusing this classic arrangement of Warren's best writings. The fourth edition's new material includes: Warren's 50th anniversary retrospective, in what Bill Gates called Warren's best letter ever, on conglomerates and Berkshire's future without Buffett; Charlie Munger's 50th anniversary essay on ''The Berkshire System''; Warren's definitive defense of Berkshire's no-dividend practice; and Warren's best advice on investing, whether in apartments, farms, or businesses.